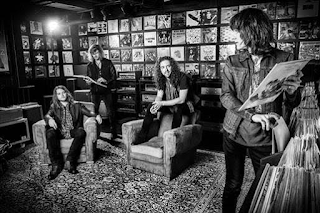 Tyler Bryant & The Shakedown, led into action by Texas-born vocalist / guitarist Tyler Bryant, will play a run of European shows as sole support to longstanding friends and fast-rising rockers the Cadillac Three from November 5th - 22nd. TB&TS – purveyors of electrifying rock ‘n’ roll, with blues and alternative leanings also coming into play – last visited Europe in May / June to guest with rock legends AC/DC, as well as playing selected headline dates of their own. Since that time, 25-year-old Tyler, now based in Nashville, plus band-mates Caleb Crosby (drums), Graham Whitford (guitar) and Noah Denney (bass), have been hard at work touring across the States, hitting stages in support of Black Label Society and Guns n’ Roses (more heavyweight names to add to a list that already includes Jeff Beck, ZZ Top & Aerosmith!). Now, the band are ready to unleash their high-proof blend of melody, muscle and psychedelic mystique alongside The Cadillac Three, joining forces with the Nashville trio for shows in the UK, Germany & the Netherlands, as well as slotting in headline dates of their own in the UK, France & Belgium. Says Tyler: “We made so many new friends across Europe earlier this year while touring with AC/DC. I'm excited that we get to return so quickly, say hello, and rock out once again. We've known the Cadillac Three guys for years, and this will be the first time we've ever joined forces on the road. It's going to be wild to say the least!" TB&TS’s latest release, and first for Spinefarm/Varvatos, is six-track EP ‘The Wayside’; produced, recorded & mixed by Vance Powell (Jack White, Seasick Steve), these half-dozen tracks see the musicians showing the full scope and sway of their collective vision – from giant groove rockers such as ‘Stitch It Up’, ‘Mojo Workin’’ and ‘Loaded Dice & Buried Money’ through to the hypnotic swagger of ‘Devil’s Keep’ and the atmospheric plea that is ‘The Wayside’, with Tyler’s background in the blues (he’s a recipient of the Robert Johnson Foundation’s ‘New Generation’ award, and studied under the late, respected Roosevelt Twitty Sr.) ensuring that raw emotion is never far from the surface.